At a sturdy 2.6mm wide, you'll find yourself in the desired shape with ULTRA EL Wire. ULTRA EL Wire uses exactly the same splitters, drivers and sequencers as standard EL Wire. 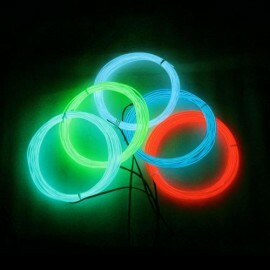 the brightest color of the wire is the Aqua, Lime Green and White. The right side is the right one.